Germany has decided on a campaign of unrestricted submarine warfare. From tomorrow its U-boats will be allowed to sink enemy merchant ships without warning. They will also be able to attack neutral ships suspected of carrying war materials (broadly defined) to Germany’s enemies. This is likely to bring the United States into the war against Germany. However the U-boat campaign is expected to bring the war to a victorious end in five months or so, long before the Americans will be able to recruit and train an army. Since October the U-boats have already been operating an escalated campaign against enemy shipping. This has been run according to traditional prize rules, whereby enemy ships are stopped and searched; if they are then sunk, their crew and passengers are allowed to abandon ship first. Enemy shipping losses have amounted to an impressive 360,000 tons a month since October, without antagonising the Americans. German leaders are confident that even more losses will be inflicted once the U-boats are able to strike without warning. These losses will devastate the British economy and starve its people into submission. The British Empire continues its efforts to conquer German East Africa. Some successes have been achieved, with territory overrun and German units forced to retreat. But the main German force under Lettow-Vorbeck remains intact. The Germans have a lot of space to retreat into and winkling them out is not going to be easy. Now the rains arrive, making it more or less impossible to move large bodies of troops through the colony. The British advance grinds to a halt as the trails turn to mud. As they shelter from the rain, Lettow-Vorbeck and his lieutenants take satisfaction from the knowledge that they remain undefeated, ready to fight on against the enemy once the weather improves. Britain is supplying the Arab rebels through the Red Sea port of Yanbu. However the sea route there from Suez is long. If the rebels were to establish themselves in the port of Wajh, further north, it would be much easier to supply them. Wajh is also well situated to launch further attacks on the railway line to Medina, where a strong Turkish force remains in place. The rebels and the British decide to launch a combined attack on Wajh. Emir Faisal, son of Sharif Hussein, rebel leader and self-styled King of the Arabs, will attack by land. The British navy supports his advance by placing water tanks south of the town to slake the thirst of Faisal’s army. The British will also land a small force of Arabs and British marines to the north of Wajh, to block any Turkish reinforcements. Today is the agreed date for the attack on Wajh. The British ships arrive and land their men to the north of the town. There is no sign of Faisal, but the small advance party of rebels attack the town anyway. The Arabs are lucky: most of the Turkish garrison has already been withdrawn. Those that remain either surrender or retreat into the town’s mosque and fort, but they are soon dislodged by British naval artillery. Wajh is now in rebel hands. And where is Faisal? The emir has been using his march to impress tribal leaders with the size of his army, thereby encouraging them to join his rebellion. When news of Wajh’s fall begins to circulate, the tribesmen flock to offer Faisal their allegiance. 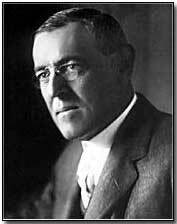 President Wilson is not giving up in his efforts to bring the war to a peaceful end. Before Christmas he asked the belligerents to state the terms on which they would agree to end the war, hoping that this would help to kick-start negotiations to an end. But their response was non-committal. The Central Powers did not state terms but merely expressed a willingness to negotiate, while the Allies set forth general terms that made clear their intent to prosecute the war until victory. Now Wilson addresses the US Senate. Once more he talks about the need to bring the catastrophic war to an end, to achieve a “peace without victory”. And he looks beyond the immediate end of the current conflict. Steps need to be taken to ensure that a war like this never happens again. He talks of a post-war “concert of power”, some kind of combination of the nations that will prevent future conflicts, and an end to the entangling alliances that preceded the outbreak of violence in 1914. Furthermore he proposes universal democracy, the freedom of countries to order their own affairs without external interference and a general adherence to liberal values. The belligerents appear to be intent on continuing the war until they can impose a peace on their enemies. Wilson’s vision therefore appears rather utopian. But it serves as a useful corrective in a world that appears to have taken leave of its senses. South Africa’s General Smuts has been commanding British Empire forces invading German East Africa. At one level the campaign has gone well, with the invaders making great advances and overrunning large swathes of territory, particularly the area around the coast. But in other regards the invasion has proved less successful. A decisive defeat has not been inflicted on the Germans, whose forces in the colony remain largely intact. The British Empire forces have suffered relatively few casualties in combat but are experiencing a steady attrition from disease. Their press-ganged African bearers are experiencing an even higher attrition rate. Now that the rains have begun, the invasion’s progress comes to a halt, giving the Germans a much needed respite. Still, with the coast overrun and the Germans confined to the interior, the process of mopping up enemy resistance should not take too long. Smuts will not be around to see the final victory in East Africa. He is now on his way to London, to represent South Africa at the newly formed imperial war cabinet, where he intends to claim the benefits due to his countrymen for their successful invasion of German East Africa. Germany will soon be commencing a campaign of unrestricted submarine warfare. German leaders know that there is a high likelihood of this bringing the United States of America into the war against them. They are confident however that the U-boats will defeat Britain before the Americans can raise an army to fight in Europe. And in any case, the U-boats should be able to disrupt the transport of any US troops across the Atlantic. Nevertheless, the Germans are thinking of other ways of dealing with the American threat. Attention turns to Mexico, America’s southern neighbour, with whom the United States has a troubled relationship. Could Mexico be enlisted as an ally of Germany, thereby drawing American attentions away from Europe? Arthur Zimmermann is Germany’s deputy foreign minister. He sends a telegram to the Heinrich von Eckardt, Germany’s ambassador to Mexico. Eckardt is to propose an alliance to Mexico, offering Texas, New Mexico and Arizona, territory they lost to the USA in the 19th Century. The Mexicans are also to be furnished with generous financial support. A quirk of the current diplomatic arrangements is that German communications to its overseas embassies run through Britain. The Germans are no fools and are aware that the British are monitoring their communications. Zimmermann’s telegram is a sensitive one, so it is despatched in an encrypted form. Unfortunately for the Germans, the British have cracked their diplomatic cyphers. Now Room 40, the secret British signal intelligence unit, sets to work on the telegram. Soon they will reveal its explosive secrets. Germany has decided to begin a campaign of unrestricted submarine warfare. Its U-boats will be ordered to attack enemy merchant ships on sight, without stopping them to check their cargos or to give their crews time to abandon ship safely. To prevent Allied ships avoiding interception by flying neutral flags, the U-boats will also be allowed to attack neutral ships at will. The new policy does not come into effect until February. However the U-boat campaign is already beginning to increase in intensity. Previously U-boats sailing to the Atlantic would sail around the north of Scotland. Now though they begin to make the more risky passage directly through the narrow seas of the English Channel. This will give them more time on patrol to attack enemy ships.